When it comes to grace, many people dwell in one of two extremes. The first is the land of “earnings”. These people have difficulty accepting God’s grace. Often they say all the right things but their actions tell a different story. These people usually strive continually to “earn” God’s grace. They do this through acts of service, or hours of Bible study, or any number of “good things”. Now, none of these things are terrible in and of themselves, but when the motivation is to earn favor with God, well, that’s not exactly in the spirit of acceptance of God’s grace. They are generally the people who like to point out the specks in the eyes of others while they’ve got a giant board sticking from their own… and perhaps the board is the fact that they are more worried about others’ sin than they are their own. They say God’s grace is sufficient, but they don’t live like they believe it about themselves or others. 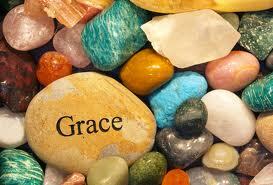 When I was in AWANA many years ago, we memorized the definition of grace as “undeserved, unearned favor and kindness”. There are those who believe we will no longer sin… like ever, if we are saved. I find a flaw in this rational because if we could be perfect, then why would we need Jesus? There are also those who believe that we can lose our salvation, but then where is the power in the blood? I found an interesting piece that goes into the original language of the Bible (LOVE to study the original language) on the topic of whether or not we can lose our salvation. I believe it’s quite clear that God’s grace is a gift that He offers freely… and that once truly accepted, it’s ours… forever. Ok, so what about that second camp? Well, those live in the land of “increasing”. These are the ones who say, “It’s OK that I sin because I’ve got grace.” Um, well, that’s not entirely true. In fact, it may not be true that you have grace after all if your actions constantly demand an increase. Those who truly grasp and take hold of the free gift of grace, are not blinded by such notions that their sin doesn’t matter (because of increasing grace). On the contrary, they do not want to willfully sin. Does this mean that they suddenly become perfect human specimens, absolutely not, but righteousness is not credited to us out of perfection… it is credited to us through faith. If Abraham’s faith could be credited to him as righteousness (and we know he wasn’t perfect), how much more is our faith in Christ credited to us? Yes, Abraham sinned. Paul even still sinned after believing on Christ. However, does Romans 7:14-25 sound like a man who doesn’t care that he still sins because he’s got grace? No, Paul is very much in the camp of turning that sin behavior over to Christ… over and over and over again. He doesn’t want to willfully sin, and neither should the true Believer. There is a fine balance between these two extremes, and that is where those who are in Christ should live. We know that He is the potter and we are the clay… this lends itself to the image of being molded, over time, by God. If we walk, not just in His grace, but in His light, we’ll discover that we don’t deserve what He’s graciously given… but we don’t have to live in condemnation either.